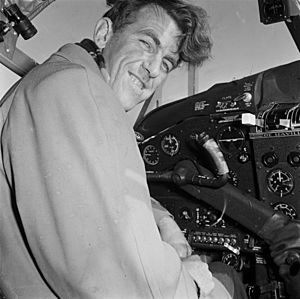 Sir Edmund Hillary, (born 20 July 1919, died 11 January 2008) was a New Zealand mountaineer and explorer. He and Sherpa guide Tenzing Norgay were the first people to climb Mount Everest. They got to the top on 29 May 1953. Mount Everest is the tallest mountain on Earth. During his teenage years, Hillary had attended Auckland Grammar School. 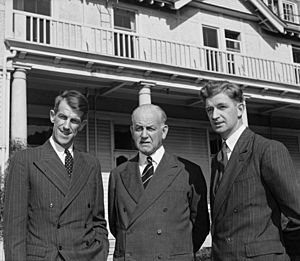 The Hillary family has had a connection with the West Coast of Auckland since 1925, when Hillary's father-in-law, Jim Rose, built a bach at Anawhata. The family donated land at Whites Beach that is now crossed by trampers on the Hillary Trail, named for Edmund. The route to Everest was closed by Chinese-controlled Tibet, and Nepal allowed only one expedition per year. 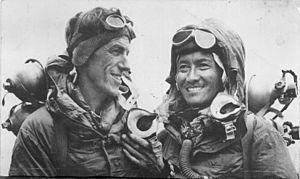 A Swiss expedition (in which Tenzing took part) had attempted to reach the summit in 1952, but was turned back from the summit by bad weather and exhaustion 800 feet (240 m) below the summit. During a 1952 trip in the Alps, Hillary discovered that he and his friend George Lowe had been invited by the Joint Himalayan Committee for the approved British 1953 attempt and immediately accepted. The two had to take care on the descent after discovering that drifting snow had covered their tracks, complicating the task of retracing their steps. The first person they met was Lowe, who had climbed up to bring them hot soup. News of the expedition reached Britain on the day of Queen Elizabeth II's coronation, and the press called the successful ascent a coronation gift. In return, the 37 members of the party received the Queen Elizabeth II Coronation Medal with MOUNT EVEREST EXPEDITION engraved on the rim. The group was surprised by the international acclaim they received upon arriving in Kathmandu. 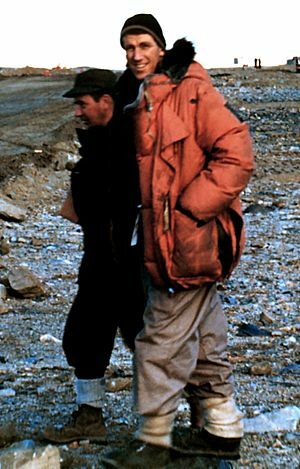 Hillary and Hunt were knighted by the young queen, while Tenzing – ineligible for knighthood as a Nepalese citizen – received the George Medal from the British Government for his efforts with the expedition. Hillary was highly critical of a decision not to try to rescue David Sharp (an Everest climber who died on the mountain in 2006), saying that leaving other climbers to die is unacceptable, and the desire to get to the summit has become all-important. He also said, "I think the whole attitude towards climbing Mount Everest has become rather horrifying. The people just want to get to the top. It was wrong if there was a man suffering altitude problems and was huddled under a rock, just to lift your hat, say good morning and pass on by." He also told the New Zealand Herald that he was horrified by the callous attitude of today's climbers. "They don't give a damn for anybody else who may be in distress and it doesn't impress me at all that they leave someone lying under a rock to die", and that, "I think that their priority was to get to the top and the welfare of ... a member of an expedition was very secondary." On 6 June 1953 Hillary was appointed Knight Commander of the Order of the British Empire and received the Queen Elizabeth II Coronation Medal the same year; and on 6 February 1987 was the fourth appointee to the Order of New Zealand. On 22 April 1995 Hillary was appointed Knight Companion of The Most Noble Order of the Garter. The Government of India conferred on him its second highest civilian award, the Padma Vibhushan, posthumously, in 2008. He was also awarded the Polar Medal in 1958 for his part in the Commonwealth Trans-Antarctic Expedition, and the Order of Gorkha Dakshina Bahu, 1st Class of the Kingdom of Nepal in 1953 and the Coronation Medal in 1975. On 17 June 2004 Hillary was awarded Commander's Cross of the Order of Merit of the Republic of Poland. In 1992 Hillary appeared on the updated New Zealand $5 note, thus making him the only New Zealander to appear on a banknote during his or her lifetime, in defiance of the established convention for banknotes of using only depictions of deceased individuals, and current heads of state. The Reserve Bank governor at the time, Don Brash, had originally intended to use a deceased sportsperson on the $5 note but could not find a suitable candidate. Instead he broke with convention by requesting and receiving Hillary's permission – along with an insistence from Hillary to use Aoraki/Mount Cook rather than Mount Everest in the backdrop. The image also features a Ferguson TE20 tractor like the one Hillary used to reach the South Pole on the Commonwealth Trans-Antarctic Expedition. 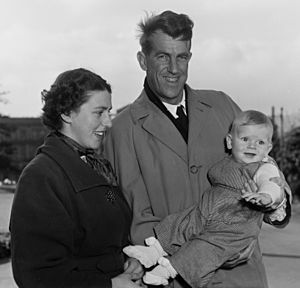 Hillary's favoured New Zealand charity was the Sir Edmund Hillary Outdoor Pursuits Centre, of which he was patron for 35 years. He was particularly keen on the work this organisation did in introducing young New Zealanders to the outdoors in a very similar way to his first experience of a school trip to Mt Ruapehu at the age of 16. 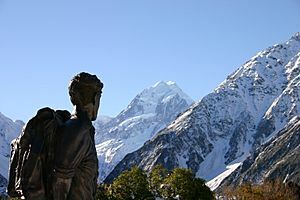 A 2.3-metre (7.5 ft) bronze statue of "Sir Ed" is installed outside The Hermitage Hotel at Mount Cook Village; it was unveiled by Hillary himself in 2003. Various streets, schools and organisations around New Zealand and abroad are named after him. A few examples are Hillary College (Otara), Edmund Hillary Primary School (Papakura) and the Hillary Commission (now SPARC). 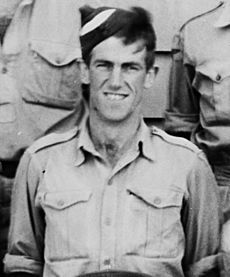 Several schools have houses named after him, including Auckland Grammar School, Edgecumbe College, Hutt International Boys' School, Macleans College, Rangiora High School, Tauranga Boys' College and Upper Hutt College. As at 1975, Hillary served as a Vice President for the Abortion Law Reform Association of New Zealand. The Association is New Zealand's national pro-choice advocacy group which was founded in 1971. As at 1978, he was a patron of REPEAL, a New Zealand-wide organisation that sought to repeal the restrictive Contraception, Sterilisation, and Abortion Act 1977. On 11 January 2008, Hillary died of heart failure at the Auckland City Hospital at the age of 88. Hillary's death was announced by New Zealand Prime Minister Helen Clark at around 11:20 am. 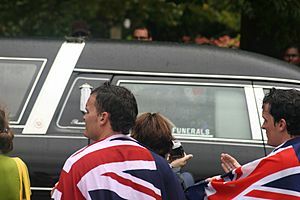 She stated that his death was a "profound loss to New Zealand". 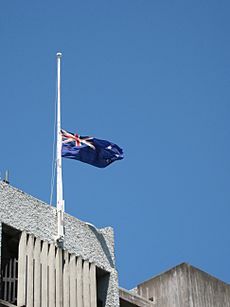 His death was recognised by the lowering of flags to half-mast on all Government and public buildings and at Scott Base in Antarctica. Actor and adventurer Brian Blessed, who attempted to climb Everest three times, described Sir Edmund as a "kind of titan". Hillary was in hospital at the time of his death but was expected to come home that day according to his family. The Sir Edmund Hillary Mountain Legacy Medal, awarded by the Nepalese NGO Mountain Legacy "for remarkable service in the conservation of culture and nature in mountainous regions" was inaugurated in 2003, with the approval of Sir Edmund Hillary. 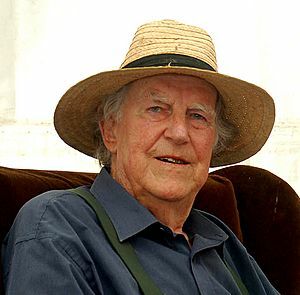 Hillary Montes, the second-highest mountain range on Pluto, is named in honour of Edmund Hillary. Edmund Hillary Facts for Kids. Kiddle Encyclopedia.